I don't know how to say "cowabunga" in Hebrew, but if I did, you'd hear me saying it today. 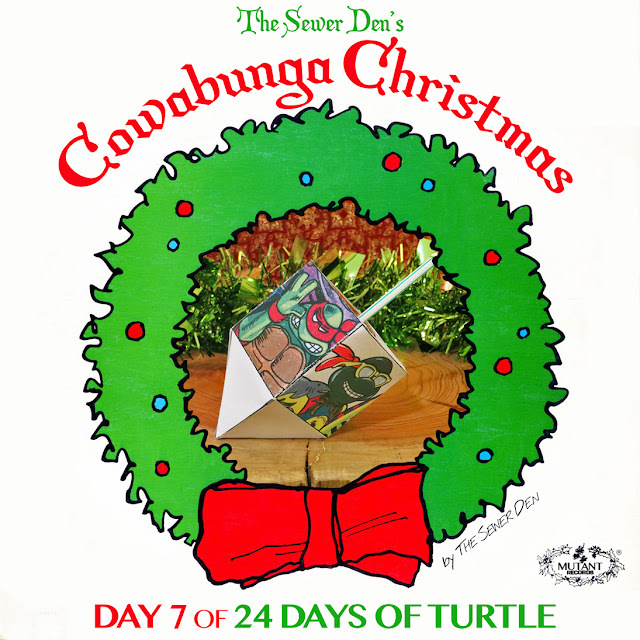 Let's celebrate Hanukkah on DAY 7 of Cowabunga Christmas! Happy Hanukkah! So what if this is Cowabunga Christmas? The world is a melting pot & The Sewer Den celebrates cultures from around the globe. Sadly, TMNT holiday merchandise is really lacking outside of the Christmas theme. Where's the Hanukkah love? I've still got my fingers crossed hoping for a Hanukkah in a Halfshell toy line. Until then, I'll take matters into my own hands. The Festival of Lights has begun and I'm honoring the holiday by taking my DIY dreidel for a spin. 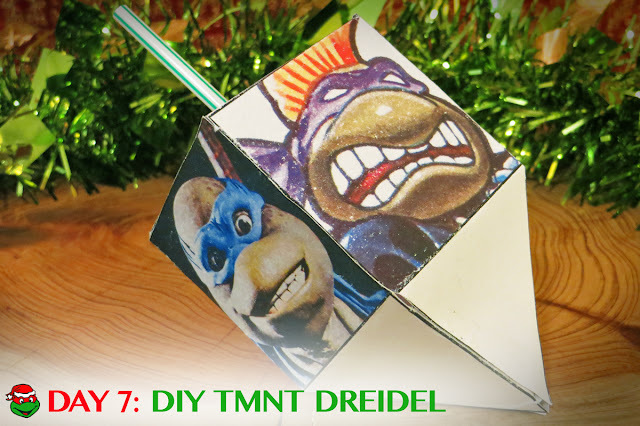 That's right, I got crafty and made my own TMNT dreidel. It's a pretty simple creation - a thick stock of paper, a little glue, and a straw popped in the top. And 1 Pizza Point on top for good measure. 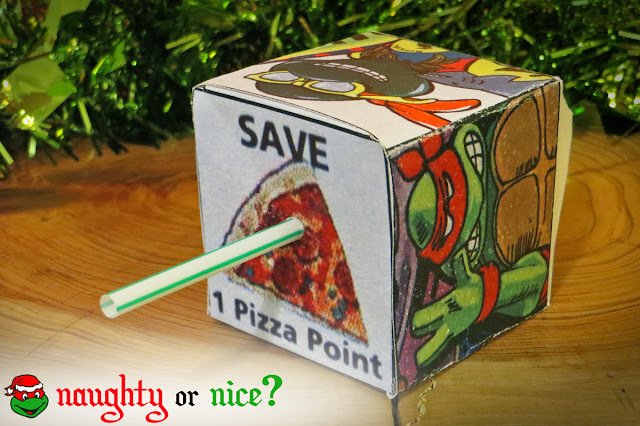 Does the TMNT Dreidel make a good gift? Probably not. It's just a free gimmick that some TMNT-obsessed weirdo (hey, that's me!) posted on his website. But, it does mutate the Hanukkah celebration to new levels of fun. Nothing wrong with putting Turtle Power into your Chagiga (Chagiga is party in Hebrew, thanks Google!). Download the dreidel and play. Have fun and Happy Hanukkah! 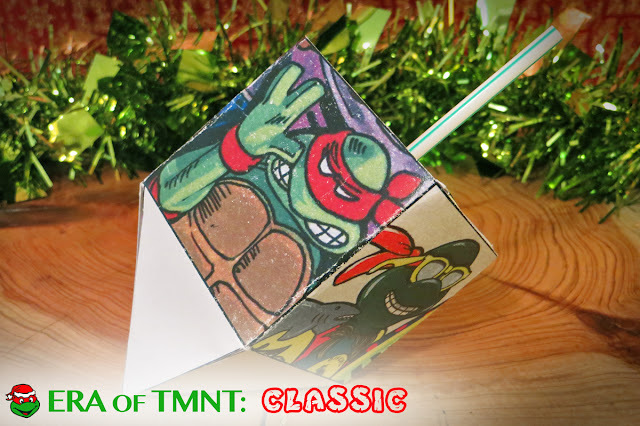 Check back tomorrow for DAY 8 of Cowabunga Christmas! Can't wait until then? Take a trip with the Ghost from Christmas Past to see what The Sewer Den put on display on December 7th in 2013 and 2014.